If you could create new World Quests that were truly "world" quests, what would they be and where would you send us? NEXT | Know Your Diablo Lore: What is actually happening in Diablo 3? We’re used to World Quests now. Daily quests specifically for reputation started way back in The Burning Crusades. They were quick 2-3 quests in a faction hub which rewarded reputation. As you gained rep, the quests changed but you didn’t venture far from the hub as you did them. This continued through Warlords of Draenor and evolved into the world questing we have in Battle for Azeroth. With the achievement to raise 100 reputations to exalted, there is a lot of grinding ahead for someone wanting this. What if there were world quests for all factions? I’m splitting hairs here, but shouldn’t a “World” Quest encompass this whole world and not just the world of the current expansion? 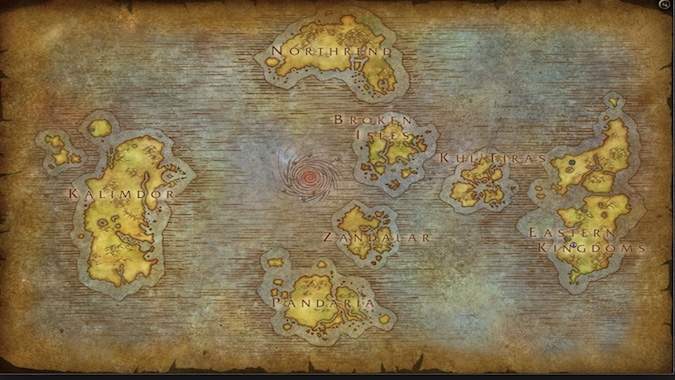 The map above is the our world — minus Outlands and Draenor. What if quests were all over this? I got to thinking about what kind of truly “World” Quests I would design. I’d have a daily quest board in the capital cities which listed the quests available. Need Ironforge rep? Do quests for the Dwarves. Need Undercity rep even though you’ve been through the Battle for Azeroth story? There could be Forsaken world quests in Silverpine. There’s a lurker in the lake in Loch Modan. Get rid of it for Dwarven rep. Or gather rare winter hops to make that famous Rhapsody Ale. Gather Undead bits from the fields under Naxxramas for Undercity rep. Dispatch fire elementals in Mount Hyjal for Thunder Bluff rep. Rewards would be gold, reputation, toys, and gear. You wouldn’t be able to pick up each World Quest until you were through the expansion levels and had done a pre-quest. I’m exalted with most factions but I’d go back and do prerequisites to open up new quest lines. I’d even like to see reputation quests be scattered across the known world. Need Earthen Ring reputation? Go help some shaman in Azsuna. You would still need to unlock the ability to see these world quests and you’d have to travel to Deepholm, for instance, to visit the quartermaster for tabards and other items, but this makes the questing global. How do you feel about this? Would you like to see world questing evolve to encompass the whole world? If you could design a truly “World” Quest or series of quests, what would it involve doing and where would you put them? What would the quest rewards be? I still do world quests even though I’m long exalted. I can be picky now about what I do. If there were world wide daily quests, I would wander about the world picking them up here and there. It would be fun and would take people to areas they maybe never saw when leveling or haven’t been in in years.